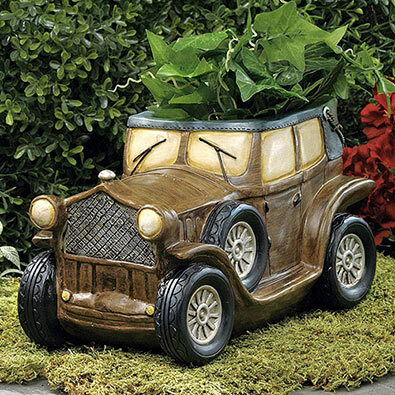 This classic car is the perfect planter for gardeners with a vintage flair. With marvelous texture and detail, our hand painted polyresin planter is a timeless accent piece, indoors or out. 16.5cm tall x 25.5cm long. Dress your flowers and plants up in the casual charm of our denim jean jacket planter. Made of quality durable hand painted polyresin, it looks like a genuine piece of worn denim clothing. Artistic detail throughout with stiching, patches and silver zipper. Display your love of denim on a porch, patio, walkway, table or shelf. Measures 28cm x 20cm x 22cm. Your guests will look twice when they see your favourite plants springing from this coiled hose planter. Create a focal point on your patio or porch. Realistically sculpted of textured resin with metallic painted details. Planting space is 15cm deep x 13cm wide at opening. Includes a 1cm drainage hole in the bottom.